Chelsea vs. Everton : 4 December 2010. Please Note – It may appear that certain segments of this match report have been cut and pasted from a variety of older reports ( keep a look out for comments about the lack of noise at Stamford Bridge ), but I can assure you all that this is all new. What with all of the freezing weather we have been experiencing of late, I decided to head up to Chelsea a little later than usual. To be honest, a few days ago, I was actually wondering if my unbroken home attendance run (which goes back almost seven years) would be under threat. I gingerly drove out of my village and the ice had the upper hand on a couple of occasions. Once onto the gritted main roads though, I was thankfully in full control. Parky was duly collected at about 10am and we were back in the familiar routine. December was going to be a very difficult month, with the deadly trio of Spurs / United / Arsenal games on the horizon. We simply had to defeat Everton, who had slumped to a 1-4 home defeat versus West Brom last week. What with the probable poor weather, I knew I wouldn’t be up in London Town until about 12.30pm. I had arranged to meet Ian from Chicago in The Lily Langtry, but I spoke to Beth on the drive up and knew that it would be unlikely, due to the time constraints, to meet up with her. A shame. It seems that I missed quite a reunion up at St. James’ Park last weekend, with Burger and Gumby joining Beth and the four visitors from California, Danny, Andy, Josh and Ed. From 1pm to 2.15pm, we spent our time chatting away to various friends from all over. So many people and yet so little time. Parky was flitting around talking to all and sundry, while I spent most of the time with Ian. Now, unbeknown to me, he had got married back in Chicago in October – so I toasted his marriage – but his wife, Denise, was a Blue of a different hue. Yes, you’ve guessed it – an Evertonian. She was having a different pre-match with fellow Toffees down at Parson’s Green and this amused me, yet of course I approved. I could tell that Ian was enjoying the mad intensity of The Goose, jam-packed full of loyal Chelsea servants, and he had a wide grin on his face. In that short spell together, we covered a lot of ground, including a mention of the Dundee football scene, in light of his family’s roots in that city of jute, jam and journalism on the banks of the silvery Tay. As always, the time for the walk to Stamford Bridge came too quickly and we said our “goodbyes” to each other. We never leave together though – Rob is invariably the last to leave (just one more Amaretto, Daryl! ) and on this occasion, Parky walked down with Rob. I zipped up my coat and donned my 1986 vintage Rangers scarf, the classic red, white and blue. Daryl must have been thinking along similar lines when he chose his game-day apparel in deepest Essex that morning…he was wearing the even more iconic Chelsea red, white and green scarf from 1972-1973. I bought a match programme and spotted that Petr Cech was on the cover on the occasion of his 200th league game for us. My mate Andy caught up with me at the turnstiles and commented about my ‘Gers scarf. He is again going up to Ibrox later this month. He was with a chap who, like me, was at the Rangers vs. Chelsea Ibrox friendly in 1986 and we briefly spoke about that game. I was in Stoke at the time, at college, and travelled up on the day of the game, a Friday in February. British Rail was doing cheap Young Persons Railcard deals that month and I got a return up to Glasgow for just £8. Scotland had all day drinking at the time ( in England this only came later ) and that game in Glasgow 24 years ago easily wins the award for the Game Where I Was Most Pissed. The game was a blur…my mate Alan was there, Cathy too. About 200 Chelsea went up. We lost 3-2 and I was steaming. The weather was bitter. Despite the fraternity between Rangers and Chelsea, I didn’t take too kindly to the home support booing Keith Jones, our young black player. I think I might have annoyed a few of the home support ( I was watching with a mate in the home Copeland Road Stand ) as I complained about this to a few home fans nearby…however, the story goes that Jonah was replaced by a Chelsea youth player called Phil Priest. A Priest at Ibrox? Surely not. The Rangers fans roared their disapproval! I knew that JT was in the team and of course it was great to see him back. Just before the game began, I visited the MHU loos…on the way out, I wrote ‘CFC’ on the steamed-up mirror by the wash basins. I couldn’t believe that nobody else had done so, to be honest. Everton, in an off-white / “whose Mum forgot to keep the whites separate?” kit, looked lively in the first few minutes and Petr Cech had to get down to save after just 25 seconds. However, we soon won the small battles and dominated the first-half. However, apart from a few off-target efforts, our first real effort came from an unlikely source. A corner was cleared out to JT and he nimbly changed shape and lobbed the ball towards the goal from about 15 yards out. The ball hit the bar and we groaned. I don’t think Howard would have reached it had it been on target. We still await JT’s first goal from distance. We had tons of possession, but there was more passing for the sake of it…Malouda was very quiet and Kalou was Kalou. Despite a sustained bout of “Chelsea / Champions” from Parky’s corner of The Shed, the atmosphere was again funereal. I know it was cold, but it seemed that vast swathes of The Bridge were hibernating. I swear the atmosphere is noticeably worse game on game, yet alone season by season. With the decibel count decreasing, we’ll eventually reach complete silence and then what? Will we get noise in reverse? 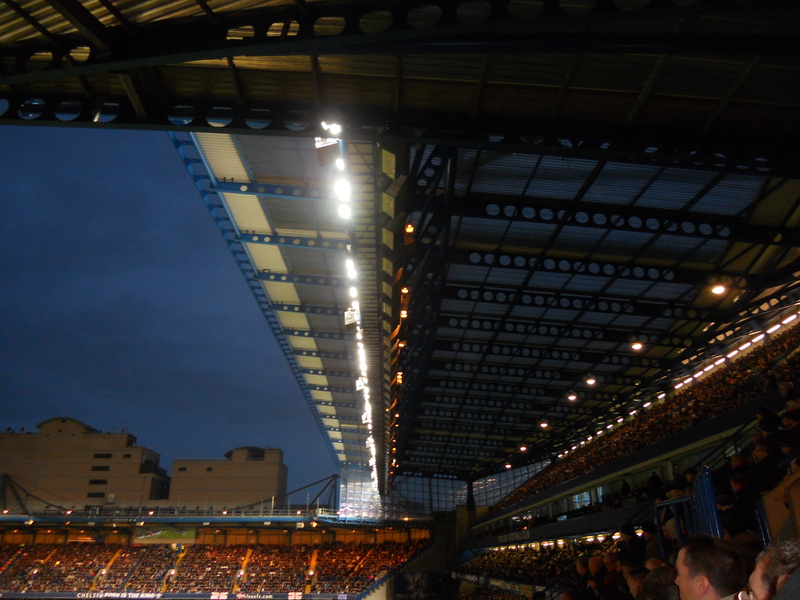 For anyone yet to visit Stamford Bridge – that once fabled hot bed of partisan support – I urge them to do it very soon, before the place produces Negative Noise. What is Negative Noise? I’m not sure, but maybe we’ll be experiencing it over the next few years…maybe when the spectators within the stadium are being out sung by sparrows in the Brompton Cemetery, when the only noise in the stadium are the shouts of the players, when we can hear copies of the Evening Standards being sold by vendors outside Earl’s Court tube station. Negative noise. You heard it here first. With no breakthrough forthcoming, I said to Alan “no doubt there’ll be boos at half-time.” That would have been unfair, since we were well on top…we just couldn’t penetrate. One moment of play perfectly summed up our lack of belief at the moment. Mikel – who has had a good season thus far – received the ball right in the middle of the attacking third, well in range of the goal, with no defender near. Rather than move the ball on to his best foot and drop his shoulder, a la Bobby Charlton, and take a pot shot, his first thought was to move the ball to another player, probably Malouda, who was marked and soon lost the ball. How frustrating. We hardly got behind them at all. Then, a calamitous back-pass by one of The Brothers Grim and Nicolas Anelka only had the ‘keeper to beat. The coming together of bodies – clear obstruction – and a penalty. However, I just knew – in a week of poor decisions by football’s ruling classes – that their ‘keeper wouldn’t get a red. And so it proved…the ref’s decision was met with a stadium-wide moan. However, Didier easily despatched the pen and we went into the break 1-0 up. No complaints. In the loos at half-time, I was warmed by the sight of two additional ‘CFCs’ on the mirrors. During the break, I spotted a great match report in the programme from Rick Glanvill of an eventful Chelsea vs. Everton game in that previously-mentioned 1985-1986 season ( missed penalties, sendings off, I remember it well…it was my first ever Chelsea vs. Everton game, in fact ). The second-half was horrible. Our confidence deteriorated and Everton sensed fear. The crowd rallied on only a couple of occasions. Leighton Baines was causing havoc down the left and Ancelotti replaced Bosingwa with Paolo. This was met with derision though – the supporters around me wanted a more positive response. We wanted to go for the kill. A cross from Baines was headed goal wards by Rodwell and his effort hit the right upright with Cech easily beaten. Soon after, Cahill studded Cech and he appeared to be in pain…thoughts of Stephen Hunt. Thankfully, Cech recovered. Everton were really giving this a good go, though. Jermaine Beckford came on as a substitute and, by way of some Pavlovian sub consciousness, the Matthew Harding went into ‘Dambusters’ mode and taunted his Elland Road pedigree. It seemed so natural. Chelsea and Leeds United – it’s still there, even after all these years. Drogba turned cheerleader after a failed attack, turning towards the MH and urging us all on, to get behind the team, to make some noise. I can’t say the crowd responded. However, it was a typical Drogba game…brutal strength and power one moment, laziness personified the next. A quick interchange of passes allowed Paolo to send in a sublime low ball into the six-yard box…Ashley Cole lunged but missed the ball. Alan claimed he had been held, but it was all too quick for my eyes. And then, the horrible equaliser. Banes shimmied past three Chelsea defenders and crossed deep into our box. I sensed fear. A header back and there was – who else? – Beckford to head home. This was so similar to too many late goals conceded at The Shed in recent years…always a knock down, always a close-range finish. The ghosts of previous games raced through my mind. To be honest, I thought our best two players had been John Terry and Branislav Ivanovic and so it was doubly disturbing to be conceding goals right in the heart of our defence. Phil Neville jogged back, alone, into his half and pumped his arms, yelling at the West Stand and then at us in the North. Memories of his brother at Old Trafford against Liverpool. God, his gurning face will live with me for a while. Hateful. The referee signalled an additional seven minutes, but more than a few fans left…”thanks for your support.” Of course, it wasn’t to be…more dropped points, more boos, another bad day at the office, another “difficult moment.” As I descended the MHU stairs, I dreaded Tottenham next Sunday. Parky and I were forced to sit in a line of traffic before heading home and we spotted three smiling Arsenal fans at Barons Court. They had obviously travelled straight down from their game on the Piccadilly Line, but yet it seemed wrong for Arsenal fans to be living so near Stamford Bridge. It was the final twist of the knife on a depressing day at HQ. I try not to be too pessimistic, but we need to snap out of this poor run of form. We need Essien fitter – he was quiet – and we need Frank. We need to find our self-confidence, but that’s easier said than done. Malouda and Kalou are clearly confidence players but they need our support to help dig themselves out of their own personal nightmares. Lastly, crucially, we need more passion. That is down to the management team and the players themselves. As supporters, we can only do so much. Over to you, Carlo. Over to you, the players. Your club need you. This entry was posted in Season 2010-2011. and tagged 2010-2011, Atmosphere, Everton, Leeds United, Rangers by Chris Axon. Bookmark the permalink.